Longtime Shoreham-Wading River track coach Bob Szymanski stood alongside three of his most successful runners Saturday morning. The trio — John Lee, Ryan Udvadia and Matt Gladysz — had just crossed the finish line of the annual SWR July 4 5K in Shoreham when Szymanski pointed out an interesting tidbit. 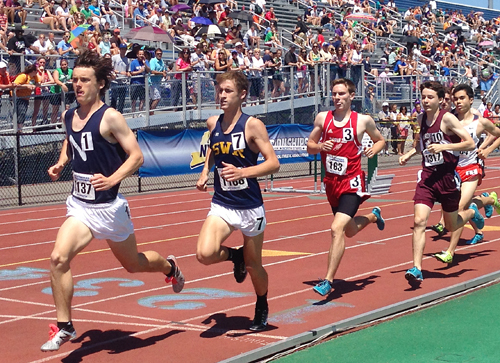 The greatest challenge in running two distance events at a meet the caliber of the New York State Championships is always the second event. Charles Villa first began pole vaulting in the spring three years ago as a freshman for Riverhead. Even in a sport that, by its nature, is difficult to begin as a youth, it was still a later start than for many of the top pole vaulters. One of Ryan Udvadia’s biggest fans is none other than his coach, Bob Szymanski. Szymanski believes in Udvadia, and not only speaks highly of the Shoreham-Wading River High School senior, but puts his money where his mouth is. Davion Porter is the relative newcomer to the triple jump. Marcus Moore is the veteran. Porter is quick to remind his Riverhead teammate of that fact.